Menlo Park is holding its annual Kite Day through 4:00 pm today at Bedwell Bayfront Park, and while the choice of kites was abundant and the enthusiasts were plenty, the wind was not cooperating (at least in the first hour of the event). With its numerous small peaks and bayside location, Bedwell Bayfront Park would seem an ideal kite flying location. In the hope that the wind would pick up, early participants enjoyed picnics or walked the still green parkland. 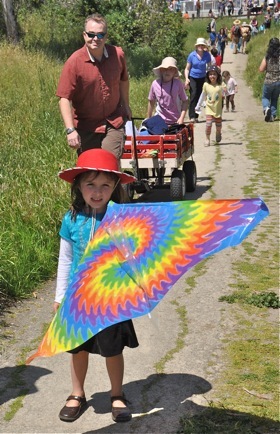 Then there was the default choice of energetic boys and girls – run up and down the hillsides willing the kites upwards. The wind did pick up! At 12:45, the breezes started to blow. By 1pm, there were dozens of kites in the air. We left at 2:30, and the skies were full of beautifully colored kites. It was quite a site to behold. I have to say this was an incredibly well organized, terrific event. After living in Menlo Park for 12 years, it was my first ‘discovery’ of Bedwell Bayfront Park. What a lovely place!